Because of all of the positive response that I've received from TCM fans around the world, I've been asked a lot of questions about the movie and where it was filmed. Most of the questions are the same, so I've decided to put up this FAQ to condense a lot of the information I have scattered around my site into one easy-to-read document. This FAQ has now grown to cover other topics besides these. If you don't find your answer here, please send me an e-mail and I'll try my best to answer it. Some will wind up on this FAQ! Q: Was the Texas Chainsaw Massacre a true story? A: NO. It was inspired by the cannibal killer, Ed Gein. Tobe Hooper told a story of how when shopping in a mall in Austin, he got tired of all the crowds. He looked up and saw a chainsaw in the hardware department and thought to himself, "Now that's a quick way of getting out of this crowd." If you still don't believe me, go HERE. Q: Were the radio spots in the original 1974 TCM film for real? A: No. I received a very interesting e-mail from a TCM fan who has done some research on his own regarding the opening radio spots. Where the announcer talks about human remains being exhumed. Go here to read his mail on the subject, as well as some other facts about the movie. A: The actor who played the radio announcer, at the beginning of the film, was Levie Isaaks. He is now a successful cinematographer in Los Angeles. Other voices in the film were Joe Gracey and Wayne Bell. Q: Where is the family house today? A: It has been moved from Quick Hill in Austin, TX. to Kingsland, TX. where it is now a restaurant for the Antlers Inn. Q: Can I send you my feedback on the website? A: Yes. I get a lot of e-mails about the site, some end up in the Hate Mail section while others are nice. Q: How do I get to where it was filmed? A: There are many film locations used for the first TCM film in 1974, its sequels, the remake in 2003 and the prequel in 2006. Texas Chainsaw Tours can take you to most of these places over the course of a day or two. Or if you just want to see and read information about these locations for the first film, THIS PAGE is a good place to start. Q: Where is the gas station & the cemetery? And where was most of the Hitchhiker footage shot? A: The Gas Station/BBQ Shack is in Bastrop County, TX. Go to this page for more information. According to Allen Danziger, the Hitchhiker shots were mostly done in Bastrop as well. The cemetery is located in Leander, TX. It's called the Badgad Cememtery. For more information on the cemetery, please go to this page. Q: Where is the film location where Franklin urinated in the Amphora can? A: I posed this question to Paul Partain. Here is his response. "the location was on the South side of Hwy 79 East of Round Rock just around the curve from a convenience store and before you get to the Georgetown road (Church street in G'tn). The amphora can was taken off in the bushes by Tobe, Daniel and others to get "wild sound" of someone actually whizzing into the can. I seriously doubt anyone would have saved the can after that." Q: Why does The Cook refer to the Grandparent's house as the "old Franklin place" when Franklin's last name is "Hardesty"? A: I posed this question to Paul Partain. He explained that Franklin was named after his Grandparent's last name. This carries his Grandparents last name to his first name, thus allowing for "Hardesty" to be his last name. Q: Who previously lived in the family house? A: According to Barbara Thomas, the owner of the Kingsland Old Town Grill and the Antler Inn, she said that many families lived in the home since it was built in the early 1900's. It seemed as though a different family lived there every ten years. To this day, people that grew up in the house drop by the restaurant for their great food and to say "Hi". I have asked that Mrs. I do have an interview with a former occupant of the "Leatherface" home for more details. You can read that interview HERE. Q: What's with the upstairs of the Leatherface home painted pink with the funky wallpaper? A: According to the current owner of the house in Kingsland, TX., the previous owner told her that they painted most of the 2nd floor pink to try to get their kids to sleep upstairs. They were too scared to sleep upstairs, so their parents tried to make it a bit more comfortable for them to spend their nights up there. The wallpaper was later added. Interestingly enough, the same wallpaper that was used upstairs is the same pattern, but different colors used for the upstairs in the sister home. I have a scan of a sample of the wallpaper that I took from the sister home when it was being moved to Georgetown, TX. just north of Austin. Q: Where is the original cast, and what are they doing today? A: Please visit my "Where Are They Now" section. Q: How can I get in touch with the cast members for an autograph? Is there a TCM fan club? A: Yup! There is a fan club at www.tcmfanclub.com. If you'd like to get an autograph from a cast member, please visit my merchandise page. I interface directly with most of the cast members personally. Q: Where is Leatherface's costume, masks and chainsaw today? A: Ed Neal told me that Tobe Hooper had most props and other equipment (including the original 2 reels of film) in a storage room in Austin, TX. Tobe's mother got tired of paying the rent on the storage facility and put the box(es) out on the curb where there was already some trash to be thrown away. Ed picked up the items for himself. He said that he kept a few items but a lot of it went to the Humanities Research Department of UT Austin. I also posed this question to Gunnar and in an e-mail he sent to me in response. "As for the costume and mask, etc, I don't know what happened to them. I certainly didn't get any of that. My friend bought the "killing" mask from Bob Burns, so maybe Bob had the rest of the stuff. Kind of doubt it, though. I understand that at some point a bunch of the props were put out on the street for the garbage truck to be salvaged. I think Ed Neal retrieved some of that, but don't know for sure." A: As for the, Gunnar has said that the chainsaw used in TCM (2) belongs to Tobe Hooper and it rests in a glass display case. Q: Was Marilyn Burns deliberately credited as "Anonymous" in TCM 4, or was that a post-production error? A: I posed this question to Marilyn herself. Here is her reply. "I am a member of SAG and AFTRA. I would have been in trouble if I said a word on film. It is against union rules to be in a non union film. I just did it as a joke and didn't want any credit. I haven't seen it myself but I thought I just flew by on a gurney for a spilt second. I guess I will rent it someday but the whole deal was just for fun. I was a crazed homeless idiot that I never thought anybody would know it was me." Q: How hot was it on Quick Hill in July and August, especially when they did the dinner scene? A: Here are some stats for you. I compiled this data from http://www.srh.noaa.gov/FTPROOT/EWX/html/cli/aus/aclidata.htm. TCM was shot from July 15th, 1973 until approximately August 14th, 1973 in Austin, Round Rock and Bastrop, TX. Between these dates, the record high temperature was on July 26th at 97 degrees. The record low, again in this time frame, was on July 31st at 83 degrees. The average temperature during the 32 day shoot was 92.7 degrees. Although these temperatures never hit the 100's, which is common during a summer in Texas, we have to keep in mind the environment the cast and crew were in. The house was not cooled whatsoever. All ventilation was closed because the scene was set for night time. There were stage lights running at high temperatures and the place smelled badly. (For more info on why it smelled, refer to this page). They couldn't use any fans because fans would make noise and cause people's hair to fly around. Since the movie (for most of the shoot) was shot in sequence, I have to assume that the dinner scene was shot in August of 1973. There was a high of 96 degrees on August 9th, but no temperatures went below 90 for the remainder of the shoot. I wish that someone had taken a thermometer in with them to the dinner scene for an accurate measurement. But it's easy to approximate by this data that it indeed was over 100 degrees in the house. Q: How can I order one of Gunnar's books or documentaries? A: This was asked by another TCM fan. Here's Gunnar's e-mail reply. "Well, let's see... The only book that's in print is "Islands at the Edge of Time." I'm not sure what the price is. The hardback is something around $25-27, the trade paperback around $20. I don't sell the book myself, but they can order it from any bookstore. The publisher is Island Press, in Washington, DC. As for videos, yes, "Penobscost" is for sale. They need to buy it from Acadia Film Video (my partner) at PO Box 550, Mt. Desert ME 04660. The price is $24 ($20 plus $4 shipping), and the check should be made out to Acadia Film Video." Q: What does the future hold for Quick Hill? A: It's not good. Here is some information from the La Frontera web site. Q: Are there any easter eggs on any of the TCM DVD's? A: YES! An e-mail from Julian Smith who has the UK version found an "Easter Egg" on the Pioneer DVD. He said that if you play the film and then access chapter 36, there is a 10 second clip of a baby holding a bone standing by the light made out of a severed arm on the set of the Leatherface house. This does not come up in any of the menus. Julian is using a Samsung 709 DVD player. Q: Where are the original film locations for TCM 2? A: I posed this question to Bill Moseley who played "Chop Top" in TCM 2 and he replied in this e-mail. "hmmm, KOKLA was right behind the old newspaper building in downtown Austin where we shot the lion's share of our interiors. Methinks the newspaper bldg. was long ago razed. KOKLA might have been little more than a fascade erected solely for the purpose of Saw 2- I didn't shoot there, don't remember "going around back." Our other location was an abandoned amusement park with Swiss stylings in Prairie Grove, TX, just up the road from a cavern tour called "Inner Space." thanks for asking, bill m"
"You had asked the actor from TCM 2 chop top where the film locations for part 2 were, he gave you the wrong information. He had said the home of the family in the movie the Texas Battleland was shot in Prairie Grove Texas and right around the corner from Inner space caverns tour. First of all the Texas Battleland place was shot in Prairie Dell TX about 20 min north of Georgetown TX. The Inner space caverns tour is about 50 min south of the place. The place used to be call Prairie Dell Lake Amusement park and it was demolished shortly after the movie. The interior of the Amusement park was actually shot in the old newspaper building behind American Statesman Building they used the first floor to shoot parts of the interior of the Amusement park and the 2nd floor for the filming of the radio station, it was also demolished shortly after the film was made. The Cut-Rite saws Lefty stops to buy chainsaws went out of business a couple of years ago like in 2001 or 2002." "The place Cut-Rite Saws used to be on either 6th or 12th street. I used to have the address but I lost it. I have the old phone number but it is disconnected now. If you want the specific address for Prairie Dell Lake Amusement Park you have to go to a website I believe its ultimatebusinessfinders.com in search put the name and then its like 4.00 you pay with a credit card to get the old address. I wanted to get the specific address but i don't have a credit card. Second the place was demolished, the only thing I know is it used to be right off of 35. YOu used to actually see the place from the hwy. But I do know that the exit is 280. The city it was located in was actually Salado tx, but most people called it Prairie Dell Tx because it is the main street off of exit 280 off of I-35. If you look on maps most of them actually have Prairie Dell on there. The place Cut-Rite Saws was actually the same kind of business used in the film. I actually called the shop and spoke to someone back when it was open in 2001. I searched up and down 12th street and 6th and couldn't not find any specific landmarks that looked similar. So either they tore it down or it was remolded and turned into something else. "The Cut-Rite chain saw store is on the end of 5th street closest to Loop 1 (MoPac). It is currently being remodeled into a bar, but the owner is leaving the structure and building mostly in its original state and is just adding a bar and fixing damage that violates code. The old Cut-Rite sign is gone now, and the new bar will be named the Mean Eyed Cat after the Johnny Cash song of the same name. Apparently there eventually will be a large painting of Jonny Cash on one of the interior walls behind the bar." Q: Who was responsible for the wardrobe in TCM? I don't see any credits for the wardrobe. A: A TCM fan asked Bob Burns, the art director this question via e-mail. He said that there was no one person responsible for the wardrobe. But rather, the cast was responsible for bringing their own clothes in accordance with what Tobe Hooper and Kim Henkel wanted for the script. Q: Does anyone know anything about the extras that appeared in the cemetery scene? A: I got an e-mail from Scott McCullogh on 07/24/01 explaining to me that his great grandfather appears in the film during the cemetery scene. See the picture below. 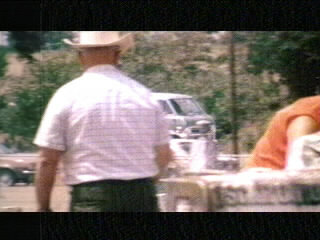 This man with his back to the camera and the cowboy hat is named Lois Fulton Giddens. According to Scott, he had heard that some people were making a film in Bagdad Cemetery and wanted to see what was going on. Many of Scott's family is buried at this cemetery today including Mr. Giddens. There is even an elementary school named after him in Leander, TX. You can visit the school's web site at http://giddens.leander.isd.tenet.edu/. Q: Where did the Chevy truck come from that The Cook used to kidnap Sally with? And where is it now? A: David Miller, a Fan Foto contributor, asked this of Bob Burns and below is his reply. "The truck... [was], like much of the stuff in the film, borrowed from friends. The truck belonged to a friend of mine who now lives in Mexico (I know not where) and is long gone. As I recall, it may have been a 1953 model..."
Q: What has happened to the swing that Pam swung on? A: According to John Thomas, a former occupant of the Leatherface house on Quick Hill, he has confirmed that the railroad ties that were used to build the swing stand are still being used by his father for other purposes. Although he does not know what happened to the actual swing, the Antler Inn has recovered a swing that was mounted by chain from the ceiling of the front porch. This swing is very weathered but it is not known if it's the actual swing that was used in the movie. Although this swing looks VERY similar to the one used in the movie. It is also obvious that there was no swing on the front porch in the movie. But the construction of the swing is different than the one from the movie, which leaves 2 possibilities. Either the swing that has been recovered from the front porch is not the swing from the movie, or the swing was rebuilt after the movie. This swing that was recovered will be up for auction on eBay along with a certificate of authenticity signed by the Antler Inn and myself. Please keep checking my news and updates page for more information about this auction. Q: What happened to Ed Guinn, the guy who played the 18-wheeler truck driver at the end of TCM? A: According to the web master for http://www.geocities.com/horrorx2000/Horror_X.html, he had a lengthy conversation with Ed and they talked about his role in the movie. He is currently doing promotions for low budget filming business in Texas. Ed said that he took his role very seriously with an "all work and no play" attitude. He was so nervous during the shooting that he would forget to stop the truck in time for the filmmakers to prop the dummy Hitchhiker in front of his truck and almost hit a real person. I've been told that a complete interview with Ed will soon be posted to the above mentioned web site. I have also posted a couple of pictures of Ed as he looks today in my Fan Foto section under Tim Harden. Q: How can I get a copy of the documentaries that have been done on the Texas Chainsaw Massacre? A: There are at this time four documentaries on Texas Chainsaw Massacre. The first is Brad Shellady's documentary filmed in the 1980's called "Texas Chainsaw Massacre: A Family Portrait". It's only available as it's own package - it's not included in any of the TCM DVD releases. You can usually order the DVD version from Amazon.com and receive it in 24 hours. The second documentary is The Shocking Truth, a full length movie about the making of the film. There is also Flesh Wounds, a featurette that, along with The Shocking Truth, is available on most re-releases of the original TCM film. Check out my chapter 3 in the film! The fourth known documentary concerns the third sequel which is the Texas Chainsaw Massacre: The Next Generation. That documentary is available for $29.95 and there are no merchant account fees associated with the price. Send your money to this address for the video. Q: Where can I find the original soundtrack to the original 1974 TCM film? A: Unfortunately, there is no official soundtrack to the film. Roger Bartlett and I have been working on that project, but don't anticipate it to be done anytime soon. For more information on the music of the film, go HERE. Q: What are the license plate numbers on the vehicles that are in the movie? A: There is no guarantee that these are 100% accurate. They were submitted by Bogues and he worked hard to figure these out. Van/BGH-119, Black Maria/J-1605 and the Cook's Truck/AF-5468. Q: When were the full moon shots taken for the film? A: Here is a direct link to the U.S. Naval Observatory that has recorded the various stages of the moon back in 1973, when the film was being made. Q: What kind of chain saws were used in the TCM films? A: Shane Brown of Brown's Saw Shop in Louisianna answered this one for us. The Texas Chainsaw Massacre (1974) The first saw in the series is the poulan 306a. Gunnar Hansen handled this baby with ease but rest assured, this saw is very heavy. one of poulan's best made saws, it is now a collectable. the saw was made from 1972 to 1980. Chainsaw part 2 (1986) The next is a craftsman 4300. Bill Johnson used this saw in the show. It was produced by Poulan for craftsman and was made from 1982 to 1988. "Grandma's saw" at the end of the show was a Poulan 361. The silver saw Lefty Enright used was a Dolmar chainsaw. It was only made for 2 years and the model is unknown. Leatherface III (1991) This saw is one of creation. you can't just buy a saw like this. It is a Stihl 066 magnum. This saw was built and cromed out by a dealer in Ca. It had a custom built 36" bar. these saws were built from 1987 to 1996. The Next Generation (1997) This saw used by Robert Jacks, is a run of the mill McCulloch 700. The 700 and 10-10 models are very close in looks and is often mistaken for the saw in the original. These saws were made from 1976 to 1998. The Remake: TCM (2003) This saw used by Andrew is a husquvarna 359. this one was also fitted with a 36" bar. this saw hit the market in 1996 and is still being made today. The Prequel: TCM (2006) The same saw as the remake!